The low back, or lumbar spine, consists of five bones, or vertebrae, stacked upon one another. Between the bones are soft, spongy shock absorbers called intervertebral discs. The spinal cord and nerves are protected by these bones. Multiple ligaments and muscular attachments provide stability and mobility to the lumbar spine. The three most common causes of low back pain are poor sitting posture, frequent forward bending, and lifting heavy items. Although trauma may be a cause of low back pain, most often there is no apparent reason for the onset of symptoms. Thus, it is thought that repetitive strain on the structures around the lumbar spine is the main cause of low back pain. Loss of muscular control. If a sudden loss of muscular control in the hip, thigh, calf, shin, or toes occurs, an immediate referral to a physician is warranted. If you are not able to lift your leg to walk, rise from a chair, or walk upstairs, you may have a serious problem that needs medical attention. History of cancer or metastatic disease. Although rare, it is always a good idea to see a physician if you have a recent onset of low back pain and a history of cancer. Simple tests can be performed to rule out metastatic disease and proper treatment can be initiated. Recent significant trauma. Although rare, low back pain can be brought on by trauma such as falls or motor vehicle accidents. If significant trauma has taken place and caused acute low back pain, a visit to a physician to rule out a fracture is required before initiating treatment. Symptom location may also be helpful to identify the cause of the problem and to start self-management of low back pain. If you are currently experiencing low back pain, one or two days of rest is indicated. After this short time period, gentle self-care exercises should be started to restore mobility and decrease pain. Since poor posture is a major cause of low back pain, maintaining proper posture is important. Use a small pillow or towel roll to support the spine while sitting. Remember, if pain prevents you from exercising or if pain persists for more than 2-3 weeks, a visit to a physician, physical therapist, or other health care provider is necessary. When low back pain is persistent or interferes with normal activities, a visit to a physical therapist may be necessary. 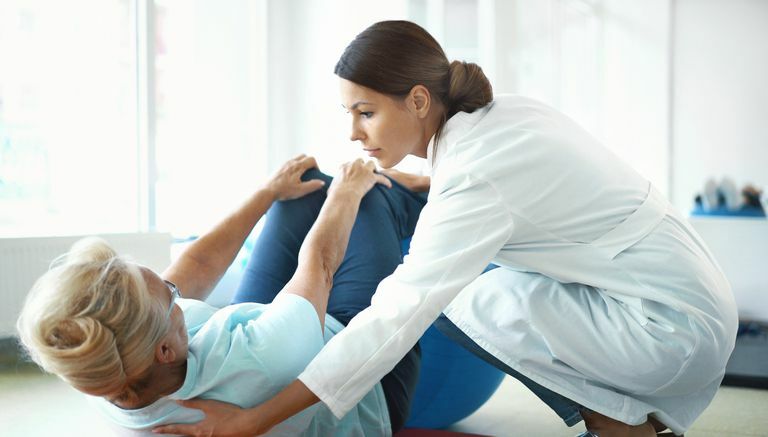 When you go to a physical therapist, he or she will perform an initial evaluation on the first visit. Be prepared to move around quite a bit, so be sure to wear comfortable clothing and make sure that your low back is accessible. An initial evaluation will consist of several different parts. First, a history of your present problem will be taken. Be prepared to discuss your symptoms and what activities or positions make your symptoms better or worse. Some special questions will be asked to help the therapist determine the nature of your problem and to discover anything that needs immediate medical attention. The physical therapist will also take measurements of how you are moving. This may include measurements of your range of motion and strength. A postural assessment will also be included in the initial evaluation. From the results of the evaluation, a specific treatment plan will be devised and started. It is important to remember to be an active participant in your treatment and ask questions if you are unsure of what to do. One of the most important times to care for your low back is when you have no symptoms. By maintaining proper posture and appropriate strength and mobility in the spine, episodes of low back pain may be avoided completely. Check in with your physical therapist, who can help you learn what you can do for your back pain or sciatica.